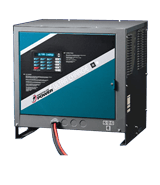 These chargers by Ametek (Prestolite Power/Hobart) are the leading industrial ferroresonant battery chargers. The ferroresonant transformer is the heart of the efficient charger. 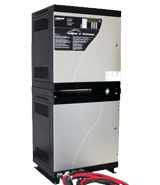 The power conversion circuitry is designed to maximize battery life with its constantly tapering charge, automatically regulated by the "on charge" battery voltage. The output current of the charger is determined by the state of discharge of the battery. The battery is precisely charged, based on its depth of discharge. High frequency industrial battery chargers utilizing IGBT technology offer high efficiency, precisely controlled charge curves, light weight and small size. 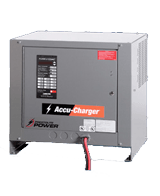 High frequency chargers provide a constant current-constant voltage-constant current (I-E-I) charge curve. Because of their extreme flexibility, they are adaptable to all types of batteries and applications.